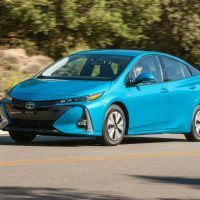 The Toyota Prius Prime Plug-in Hybrid-Electric (PHEV) was new last year, and is already outselling the Tesla Model S, Model X, Chevy Volt, and Bolt. 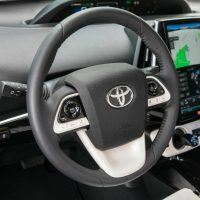 The car is catching on with consumers because Toyota is a leader in hybrid technology and a trusted brand. 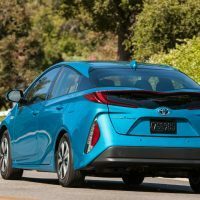 We have seen those advantages first-hand this week, as we are driving the top-of-the-line, 2018 Toyota Prius Prime Advanced. 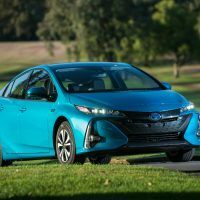 The Prius Prime is unchanged for the 2018 model year. 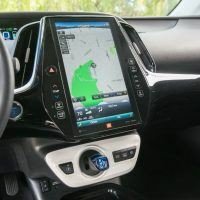 The range-topping 2018 Toyota Prius Prime Advanced ($33,100) is packed with a long list of tech features. 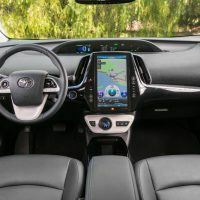 It comes with a power driver’s seat, an 11.6-inch central touchscreen, upgraded multimedia system, premium synthetic leather (SofTex) seats, automatic headlights, keyless entry, satellite radio, and wireless smartphone charging. 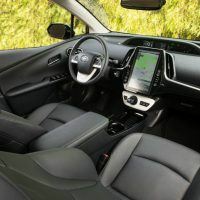 The Advanced trim also comes with extra technology features like premium audio, blind-spot monitoring, rear cross-traffic alert, heated steering wheel, auto-dimming mirror, heads-up display, a smartphone app with a charge management system, remote climate control, rain-sensing wipers, and a semi-automated parking function. Total MSRP including destination: $33,995. 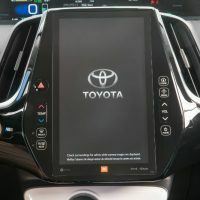 The Prius Prime feels modern inside, and the first thing we noticed was the giant 11.6-inch touch-tablet that controls just about everything. It’s fairly intuitive and you get used to it pretty quickly by simply playing with its many features. The new Prius Prime offers seating for four and comes standard with bucket-style seats in the rear. 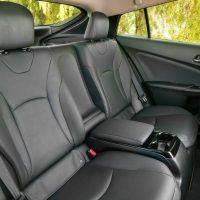 The front seats are heated and trimmed in a SofTex synthetic leather that’s close to leather upholstery. 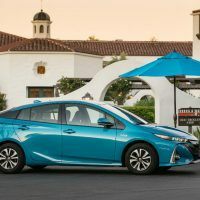 Passenger space is typical to what you’ll find in most compact cars, with overall volume being a tad less here than its other Prius stablemates. The raked roofline does cut into head space for taller passengers, but it doesn’t impact visibility from the driver’s seat much. 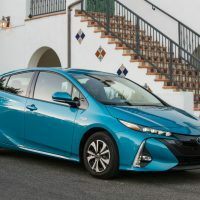 Prius Prime offers up 19.8 cubic feet of cargo space, which is above average for a compact car but less than the standard Prius hatchback’s 27.4 cubic feet. The cargo hold is less due to the Prime’s rechargeable battery, which is mounted in the rear of the car. The 60/40 split-folding back seat adds extra cargo-carrying ability, however. 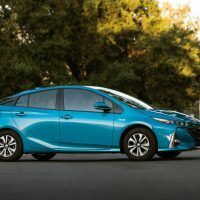 The Toyota Prius Prime is powered by a 1.8-liter 4-cylinder engine and a hybrid synergy drive system featuring a rechargeable Lithium-ion battery. 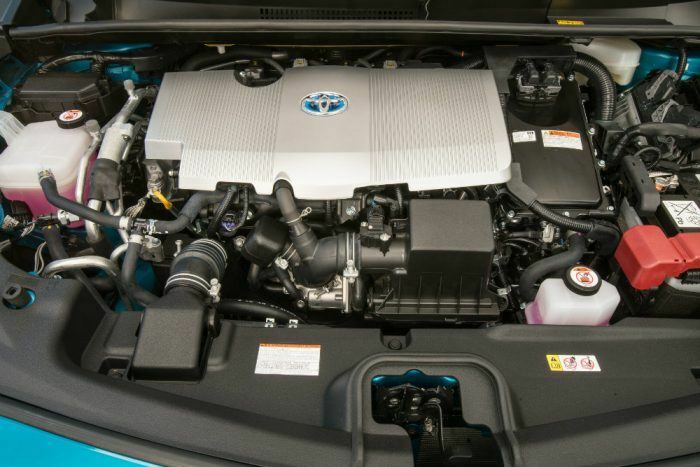 The hybrid system’s net power is 121 horsepower (90 kW). It comes mated to an electronically-controlled Continuously Variable Transmission (ECVT). The combination drives the front wheels. 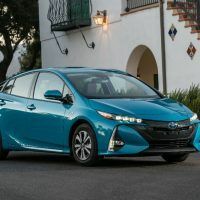 The Prius Prime gets an EPA-estimated 54 combined mpg on gas only, and 133 MPGe electricity plus gasoline, making it one of the most fuel-efficient plug-in hybrids available. 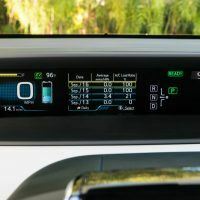 It has an all-electric driving range of 25 miles and when fully fueled and charged, the Prius Prime has a range of 640 miles. 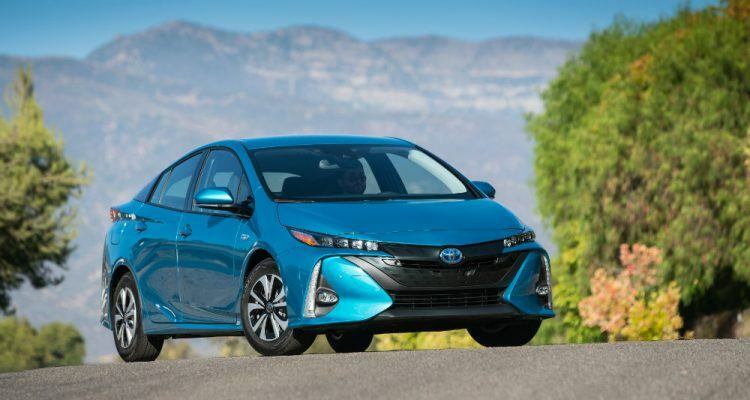 Unlike battery-electric vehicles, the Prius Prime does not need a special home charger which will save owners thousands. On a 120 volt circuit, the Prime can charge to 100 percent in about five and a half hours. Homeowners that use a dedicated 240 volt circuit will be able to recharge in about two hours. 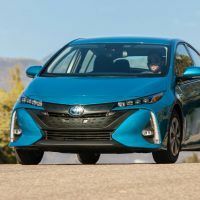 Aside from the annoying drone of the continuously variable transmission winding up under power, the Prius Prime can be fun-to-drive with its surge of electric acceleration. It was especially enjoyable as we zipped around Denver with ease because of its compact size. 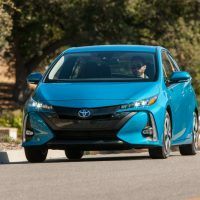 The 2018 Toyota Prius Prime doesn’t offer the greatest acceleration when getting up to highway speeds, but it shines in the fuel mileage department. 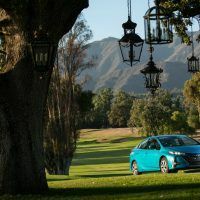 We noticed more cabin noise than the traditional Prius, likely because of its harder tires designed for maximum mileage. But the engine noise from the 1.8-liter plant is well suppressed. We took the compact hybrid up in the high country as we headed up I-70 into the mountains west of Denver, and found it to have ample power. In the tight mountain corners, the Prius Prime didn’t lean over too much; the city-hauler hugged the curves fairly well. 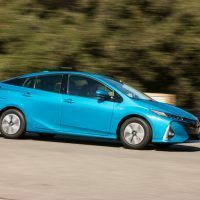 The 2018 Toyota Prius Prime more than doubles the range of the past Prius Plug-in Hybrid, while offering more standard equipment and technology. 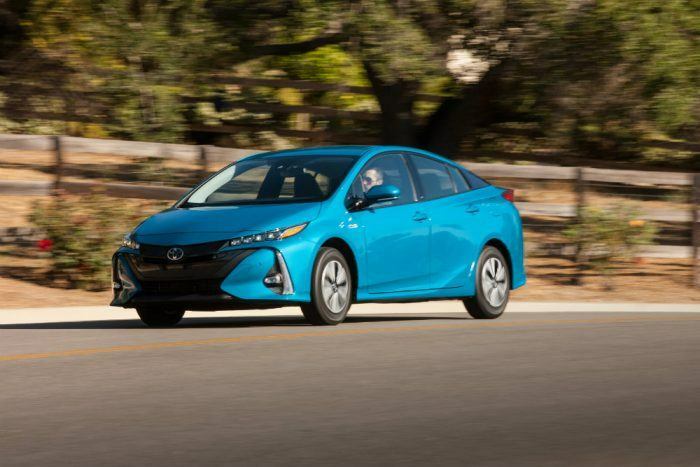 Those looking for a fuel-efficient commuter should consider the 2018 Toyota Prius Prime. It offers consumers one of the best overall values of any vehicle on the market. 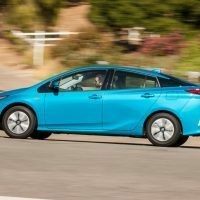 2018 Toyota Prius Official Site. 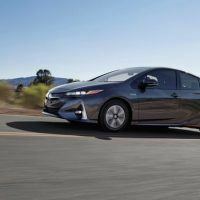 Photos: Toyota Motor Sales, U.S.A., Inc.
1 Comment on "2018 Toyota Prius Prime Advanced Review"
It looks like a Subaru SVX. from back and McLaren P1 from front. 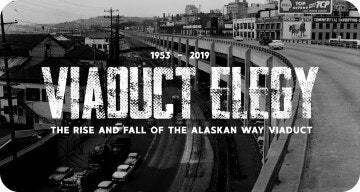 Thanks for sharing the advance review.